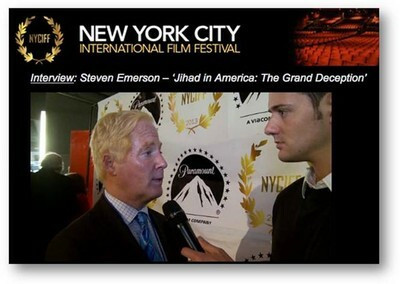 "Jihad in America: The Grand Deception," the new documentary by Investigative Project on Terrorism Executive Director Steven Emerson, continues to wow film festival judges throughout the country. After being honored as the best documentary at the 2013 Beverly Hills Film Festival and the Myrtle Beach International Film Festival, judges at the New York City International Film Festival singled out "The Grand Deception" for special recognition. Judges in New York honored "The Grand Deception" as the "Best U.S.A. Documentary on a Political Subject." Using undercover recordings, court exhibits and interviews with front-line law enforcement officials and Muslim experts on radical Islam, the 70-minute film focuses on the Muslim Brotherhood and its penetration in the United States. The objective was to juxtapose what Islamists say about terrorism among themselves against what they say for public consumption, Emerson said during a red carpet interview at the New York screening. "The other issue, of course, is to empower and to give a venue to genuine moderates who really reflect a moderate point of view of Islam who aren't given the empowerment they deserve because they are basically vilified by these radical groups who don't want their stage taken away from them." Because it covers a delicate and controversial subject, "there was a lot of nervous talk about nominating or even screening a film with such a strong subject matter," New York City International Film Festival founder and CEO Roberto Rizzo said. The festival even received calls lobbying against its inclusion. Those concerns quickly dissipated, however, after officials screened the film. "We were immediately astounded by the efforts and courage of those involved in this movie, we felt that it had to be seen and shared," Rizzo said. "Since it had not been nominated, the talk about an honorary award began. As we give a few out every year to special films, filmmakers, or actors who surpass our expectations. These awards are important to us because they are so specially decided, it is truly an honor to have been the film festival to premiere this film and it was with great pleasure that we have awarded it with this recognition." Festival officials were struck by the depth of the reporting in the film and by its tone. "It was dynamic, tolerant and easy to understand. Everybody should have the right to express their opinion if they do it with respect like the writers of this film have," Rizzo said. The documentary is Emerson's second. His 1994 film "Jihad in America," won the George Polk Award for outstanding documentary and the Investigative Reporters and Editors' Tom Renner Award for investigative reporting. For more on the film, and for excerpts, click here. Congratulations IPT! I still haven't seen the doc, yet, but this is more reason to. I wish that IPT wouldn't be so stingy about making the doc accessible to as large an audience as possible, though. Please consider what your priority is: educating the public or making a few bucks? After you choose, please act accordingly. If you choose the later, you won't have to do anything differntly than you are doing now.